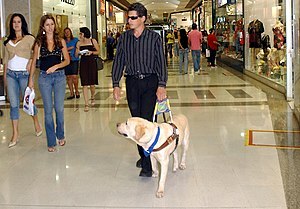 A blind man is led by a guide dog in Brasília, Brazil. A blind person with a guide dog. Guide dogs are dogs trained to help blind people live on their own. They are sometimes called "Seeing Eye" dogs. Guide dogs are one type of assistance animals, which are animals trained to help people with a disability to lead more complete lives. The blind person (sometimes called a "handler") and the dog need to work together. Both the dog and the handler must take special training to learn how to work as a team. The handler needs to let the guide dog know the direction they want to go. The dog can lead the person around things that may be dangerous, such as moving cars or other things. Also, guide dogs may be taught to press buttons to work elevators or get things for their handler. Because dogs cannot see colors as well as people, they cannot read traffic signals, so the handler must use ways to tell if it is safe to cross a street. Because the guide dog and handler will be in public, it is important that the dog stays calm in busy or loud areas. In many countries, guide dogs are allowed inside places where animals normally are not allowed, such as restaurants, stores, buses and trains. Germany started the first guide dog schools during World War 1, to help soldiers who were blinded in the war. By 1931, schools and organizations such as The Seeing Eye in Morristown, New Jersey in the United States and the British Guide Dog Association in the United Kingdom were founded. This page was last changed on 16 October 2017, at 23:42.